An ultra-fine, sensual oil that melts into your skin, giving intense and deep tanning results. Lightly scented with naturally soothing lavender, it contains vitamins and a passion flower, golden palm and sesame oil base that leaves the skin silky soft and radiant - with no oily residue. Formulated with No Tingle this oil is great for any indoor or outdoor tanner. An ultra-fine, sensual oil that melts into your skin, giving intense and deep tanning results. Lightly scented with naturally soothing lavender, it contains vitamins and a passion flower, golden palm and sesame oil base that leaves the skin silky soft and radiant - with no oily residue. Formulated with Tingle Factor 3+ for intense microcirculation stimulation and even greater accelerated tanning results. Experience JA's new standard of indoor tanning with JA Babi�, John Abat�'s sumptuous tanning and skin care lotion that babies and pampers your skin with our most indulgent tanning and skin care formula yet. This lavish, synergistic blend of tanning melanin enhancers, nourishing botanical extracts, replenishing and deep moisturizing vitamins and minerals combined with the latest, most advanced age-reversing ingredients work to deeply tan, moisturize and reduce fine lines and wrinkles while visibly firming skin. Experience baby-soft, beautifully bronzed skin with noticeably improved texture and tone. JA's new and improved formula provides even greater bronzing application and tanning performance with its reformulated blend of tanning, skincare and bronzing ingredients. New, uplifting cooling agents and aromatherapeutic fragrance of Cucumber-Melon rejuvenate and provide a deliciously fragrant tanning session. Exceptional tanning and skin care blend reveals a fast yet long-lasting rich bronzed glow and wonderfully soft, supple skin that only JA can provide. Tingle Free bronzing accelerator is suitable for all skin types. 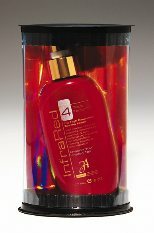 JA's intense Tingle Factor 4 create a unique and satisfying tanning experience beyond expectation. F�rm�n Tanning Enforcer, accelerated tanning created and scented especially for men, delivers powerful tanning results. Contains Vitamin A & E complex, B derivative, plus Tyrosine in a sheer vanishing formula. Tingle Factor 2 provides intense tanning results. F�rm�n Tanning Enforcer, accelerated tanning created and scented especially for men, delivers powerful tanning results. Contains Vitamin A & E complex, B derivative, plus Tyrosine in a sheer vanishing formula. Tingle Factor 0 makes it suitable for any level of tanning. Discover your hidden tanning potential and expose your richest, most arresting bronzed tan that only John Abate International can unveil with this extravagant indoor tanning accelerator; Infrared The Highest Resolution Tanning Imager. With a newly introduced Tingle Factor 4, Infrared contains JA's most extreme Tingle Factor yet for the consummate tanner aspiring to an even higher threshold of elevated biothermal microcirculation stimulation. This premium blend is lavishly formulated with exclusive botanical ingredients and essential skin-replenishing nutrients and vitamins, for unsurpassed skin care and radiance. Infrared will render the resplendent tanning and superior skincare results that discerning tanners have come to expect from John Abate International. A unique melanin enhancer formulated especially for tanners. Should be used during the first few tanning sessions to build a base tan. Once a base tan has been established, advance to the next level (Tingle Factor 1). John Abate's accelerating formula, Melaplus, should continue to be used as a daily skin conditioner on a regular basis to extend and improve tanning results. 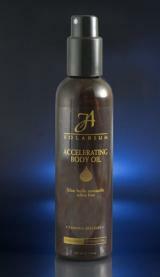 Feel the Tingle and See the Results with JA Platinum Accelerating Tanning Fluid. Platinum supplies a potent Tingle Factor 3 - for intense epidermal microcirculation and skin cell oxygenation- processes essential to creating the ultimate tan. In a addition, Platinum contains a rare DNA restorative enzyme to stimulate the production of tanning melanins, moistuize the skin, as well as promote recovery from UV damage before, during and after exposure. Platinum Zero Exhilarated Glacé Tanning is John Abaté International's most unique tanning accelerator and skin care lotion that brings a whole new sensory experience to accelerated indoor tanning. Unique cooling formula contains JA's exclusive, brisk blend of invigorating and aroma-therapeutic essences to cool, soothe and rejuvenate the senses, and bring fragrant refreshment to the skin, body and soul. Nourishing, revitalizing ingredients leave skin deeply moisturized, soft and younger looking. Tingle-Free formula invigorates, reveals a dark tan, and is suitable for all skin types at any stage of indoor tanning. Tingle Factor 4 formula is for advanced tanners. Representing the pure essence of class and quality. Created exclusively for indoor tanning, our age-defying, silicone-based elixir promotes a luxuriously radiant tan and skin tone. Skin-rejuvenating vitamins and botanicals improve the skins elasticity, suppleness and overall appearance. QUINTESSENTIAL envelops the skin in silky smoothness and intoxicates the senses with a refreshing Mango and Pomegranate scent that appeals to both men and women. 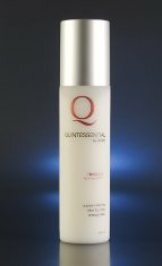 The pure essence of perfection, QUINTESSENTIAL provides a tan to be envied by everyone! The aroma-therapeutic mango pomegranate fragrance transports you to an era before time, leaving your skin beautifully bronzed. Tingle Factor 0 is suitable for all levels of tanning. Representing the pure essence of class and quality. This Bronzing age-defying, silicone-based elixir promotes a luxuriously radiant tan and skin tone with or without UV light. Skin-rejuvenating vitamins and botanicals improve the skins elasticity, suppleness and overall appearance. QUINTESSENTIAL envelops the skin in silky smoothness and intoxicates the senses with a refreshing Mango and Pomegranate scent that appeals to both men and women. 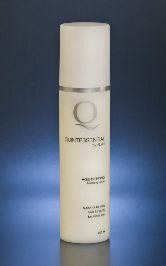 The pure essence of perfection, QUINTESSENTIAL provides a tan to be envied by everyone! The aroma-therapeutic mango pomegranate fragrance transports you to an era before time, leaving your skin beautifully bronzed. Tingle Free formula with instant and long lasting bronzers can be used with or without UV light. Extraordinary accelerator for the tanner who demands a higher Tingle Factor combined with cutting edge ingredients. TITANIUM Vitamin & Oxygen Fueled Tanning Acceleration with Tingle Factor 3+. 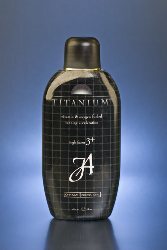 With its liquid metal appearance and sleek feel, TITANIUM assures almost instant tanning gratification with its powerful tingle and dark tanning action. Vitamins A, E and B-Complex, combined with another melanin enhancer, Tyrosine, accelerates the tanning process and takes even the darkest tan to the next level of microcirculation stimulation to impart a dark, luminous tan. UltraViolet No. 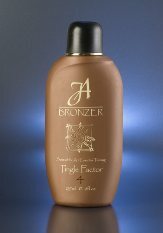 22 Sheer Dark Tanning with Tingle Factor 3+ is one of JA's more progressive formulations that provides an intense Tingle Factor 3+ in a luxurious, sheer veil of natural ingredients. Botanical oxygenators, vitamins A and E, and tyrosine are transported to skin cells for progressive spectral tanning for those who prefer a light, quickly-absorbed formulation without sticky residue. This superb, sheer formula provides speed-of-light delivery for amplified dark tanning action while it nourishes and hydrates skin for a vibrant, luminous glow. 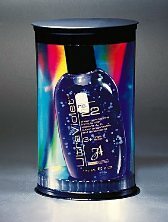 Scented with sophisticated aquatic botanical fragrance, UltraViolet No. 22 Sheer Dark Tanning will impart and maximize your tan with exceptional skin radiance and appearance.